I found this scroll saw on Craigslist. It's a Craftsman heavy duty scroll saw. The throat capacity measures about 23 1/2 inches. It has a GE 1/4 hp motor 1725 rpm and is set up with a 4 speed pulley. I have a 24" scroll saw, mod. # 103.23390. Can anyone tell me how old it is? Runs great and all original. Don't know if I should try to sell it? Any ideas would be greatly appreciated. Thanks. 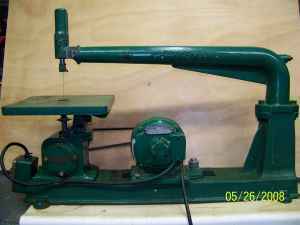 I HAVE THE SAM SAW, 1958 I BELEVE, WORKS GREAT, NEEDS PAINT, MIGHT SELL OR RESTORE IT. What Year Was That Scroll Saw Made? I have a saw just like the one in the picture. Does anyone know what year it was made and what model? Mine's in good shape and I'd like to sell it. Does anyone have a ballpark idea what the resale value on it might be? Please email me at sylmohr2011@hotmail.com with any suggestions. Thank you! SAW MODEL #149.236160 part#467522070.IF YOU CAN HELP FIND A SOURCE I WOULD BE HAPPY.. Does your 24" scroll saw have a model number and if so what is it? Mine has no model number to be found. I also have a similar Craftsman 24" scroll saw that I intend to sell. Would you share what price you paid for yours on Craigs List?